Readers of A Simple Favor: A Novel seeking engagement for all reading groups can gain further insight with this essential resource as a guide to aid your discussions. 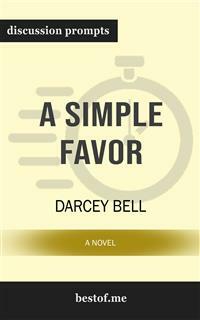 A Simple Favor is a book published by Darcey Bell in 2017. It is now a major motion picture starring Blake Lively and Anna Kendrick. This novel is about a simple favor. Mothers show extraordinary kindness to one another. When glamorous Emily asks her friend Stephanie to pick up her son after school, Stephanie agreed happily. Then Emily suddenly disappears, leaving her husband and son without any warning and without a trace. Stephanie then found herself entangled with Emily's husband but she couldn't ignore Emily's disappearance. Then Stephanie began to see that nothing is as simple as it appears to be – not love, not friendship, not even a favor. New York Journal of Books summarizes the premise of the book as: “Be careful who you trust.” In this comprehensive look into A Simple Favor: A Novel, you'll be equipped to prepare with the following: Discussion aid which includes a wealth of prompts and information Overall plot synopsis and author biography Thought-provoking discussion questions for a deeper examination Creative exercises to foster alternate “if this was you” discussions And much more! Note to readers: This is a companion guide based on A Simple Favor: A Novel This is meant to enhance and aid your reading experience, not to replace it. We strongly encourage you to purchase the original book before purchasing this unofficial companion guide. Have you ever wanted to improve your understanding of A Simple Favor? Or perhaps you are simply struggling to learn the subject matter? It’s a simple teaching technique that helps students learn and readers to grow. With versatile discussion questions for each major criteria regarding A Simple Favor, these discussion prompts are designed to help surface crucial discussions that are capable to assist toward thinking and learning on a deeper level.